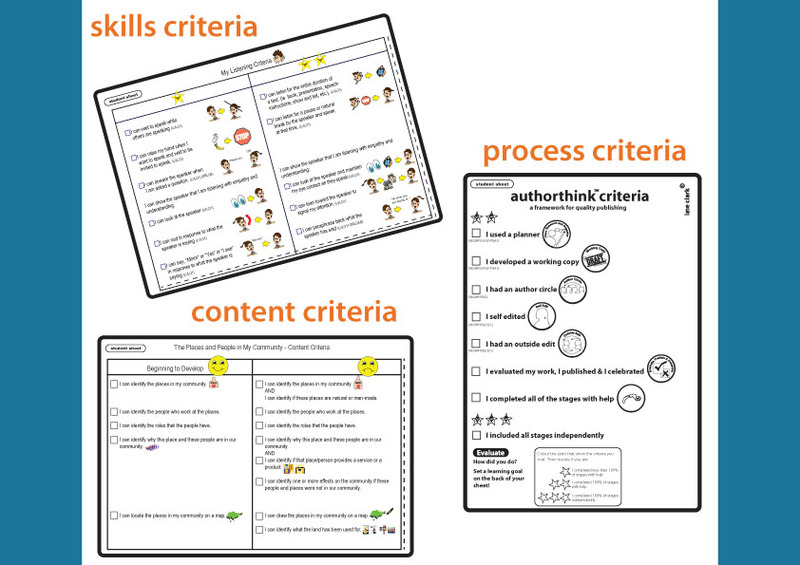 Criteria can be developed for processes, content and skills. While interconnected, each type of criteria offers the learner a different direction and opportunity for growth. Once learners become familiar with criteria are consistently using it to self assess and evaluate, it is recommended that all three types be provided. Learners and parents value what is evaluated!When ‘skills’ criteria are embedded into the learning, the ‘what to do’ is promoted. When criteria for ‘processes’ are provided, the ‘how to do’ is recognized and we send the message that process matters. Finally, when content criteria is embedded into the learning, learners begin to value not only what they need to know and understand, but as importantly, depth and breadth of knowledge and understanding are recognized. Examples of all three types of criteria have been provided for your reference and use. Enjoy! To have these guides free is a wonderful thing. I have been to a number of Lane’s workshops both in Australia and OS and know the amount of time effort and incredible skill/knowledge that are the foundation of all of Lane’s resources. These are gold.